When our guests leave, they rave about how relaxed and refreshed they feel, and as for pampering part, you could arrange for a massage for mom while she is here. Talk about the ultimate in luxury! If you came up with a great idea, but feel it is too expensive, see if you can get others involved with splitting the cost. If you are frugal and a weekend away to Lazy Cloud isn't in the budget, don't worry; you don't need to spend a lot to show you care! Create a gift by framing a photo of the two of you, or prepare a meal for mom in her kitchen and let her be the one who rests and watches TV or reads a book. Think out of the box when it comes to a gift....if time and money allow, you can Go Big, as in giving mom a weekend away, or you can go smaller and just take her out to Brunch. If you have more time than money, then give mom the gift of time and share a meal with her once a week or plan an activity that the two of you like and do it on a regular basis. Even if it is just going out for a cup of coffee and browsing the latest books in the local bookstore. Offer to pick up the tab for coffee and dessert and schedule this for a monthly activity. Regardless of what you do, make it personal. Every mom wants to feel special, especially for Mother's Day, and the more personal you make the gift, the more endearing mom will find it. 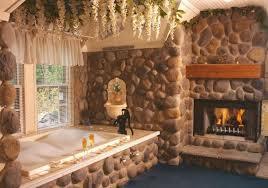 We are one of the few Lake Geneva hotels with a jacuzzi in the room for two. Our bed and breakfast in Lake Geneva, WI provides wonderful amenities with whirlpools for two that have a view of the fireplace in every suite and room. Because we offer this, we are a great place for a Mother's Day Getaway. If you liked the idea of giving mom a Mother's Day Getaway at Lazy Cloud, give us a call today at 262-275-3322 and let us work with you to create just the right gift certificate for your mom.